Grant Hill spent much of his tenure with the Orlando Magic in the trainer’s room, where to the chagrin of him and teammate Pat Garrity, control of the television remote was governed by majority rule. “Most of the guys wanted to watch SportsCenter or the Cartoon Network,” said Garrity, a former players’ union treasurer who earned a Master of Business Administration from the Fuqua School of Business at Duke University, Hill’s alma mater, after retiring from the National Basketball Association in 2008. “Everyone would leave the room and then we could switch to CNBC.” Hill, whose 18-year injury-saddled career ended after last season, had an insatiable appetite for learning, particularly about finance, Garrity said in a telephone interview. Their whirlpool chit-chat often focused on hedge funds and private equity. In a defeat for Wall Street, the "Volcker rule" won&apos;t allow banks to enter trades designed to protect against losses held in a broad portfolio of assets, according to people familiar with the rule. The practice, known as portfolio hedging, has become a focal point of regulators drafting the rule, a controversial plank of the 2010 Dodd-Frank financial law that seeks to prevent banks from putting their own capital at risk in pursuit of trading profits. The rule, named after former Federal Reserve Chairman Paul Volcker, is expected to be approved next week, ending a three-year period of regulatory uncertainty for some of the securities industry&apos;s most-profitable businesses. But it won&apos;t contain language permitting portfolio hedging, which has been "expunged" from earlier drafts of the rule, according to a person familiar with the matter. Regulators decided to remove portfolio hedging from the rule after J.P. Morgan Chase disclosed billions of dollars in losses from its so-called London whale trades in 2012. Mr. Lew, in prepared remarks for a speech Thursday morning at the Pew Charitable Trusts, said while efforts to implement the 2010 Dodd-Frank law have "taken longer than we hoped" the rules are largely falling into place and helping to bolster the financial system. He said more needs to be done, including ensuring that U.S. regulators have resources to enforce the rules and the adoption of robust protections by global counterparts to fortify the international financial system. Confessed inside trader Jon Horvath couldn’t remember which of his recommendations at hedge fund SAC Capital Advisors were based on illegal information — and which were not. In fact, some of Horvath’s best calls came “the old fashioned way” — by doing “legitimate, proper research analyst work,” defense lawyer Barry Berke told jurors Wednesday, as he continued to hammer away at Horvath in a second day of brutal cross-examination...The crux of Horvath’s testimony is that his illegal stock tips from another hedge fund analyst, Jesse Tortora, were fed to Steinberg, who knew they weren’t kosher. But on Wednesday, even Horvath didn’t seem to recall when Tortora’s information crossed the line into criminality. Berke honed in on information Horvath got from Tortora toward the end of 2007. “Do you believe you were getting illegal inside information in December of 2007?” Berke asked, rephrasing the question and repeating it at least a half-dozen times — eliciting different responses each time. “I don’t know exactly when it started,” Horvath said once. “I don’t remember how I viewed it at the time,” he said another. A pair of divorcing women are about to fight it out in court over a miniature dachshund named Joey in what will be New York’s first matrimonial pet-custody case. “People who love their dogs almost always love them forever,” Manhattan Justice Matthew Cooper opines in his ruling granting the women oral arguments. “But with divorce rates at record highs, the same cannot always be said for those who marry.” That’s the case with Washington Heights residents Shannon Louise Travis, 32, and her soon-to-be ex-wife Trisha Bridget Murray. The only bone of contention in their divorce is who will get sole custody of their 2-year-old pet. Travis bought Joey as a 10-week-old puppy from a pet store and gave him to her then-girlfriend as a gift and “a consolation for her having to give away her cat at Travis’ insistence,” according to court papers. Murray is fighting to keep her best friend, who always slept on her side of the bed. “I consider this puppy, my little angel Joey, the love of my life,” Murray told The Post. “He is my little soul mate, and there was no way in this lifetime I could ever live without him.” Judge Cooper says it’s surprising that, in a “canine-centric city where dogs play an ever more important role in our emotional lives,” he is in uncharted territory. He notes that New York law lags behind other states’ legal standing of their pets, and that “most pet owners would not trade their pets for even $1 million in cash.” Instead of regarding Joey like a piece of property, the judge — who gives the full disclosure that he owns a 12-year-old rescued pit bull mix named Peaches — will schedule a hearing to determine his fate. Deutsche Bank said on Thursday it is exiting the majority of its global commodity business due to rising regulatory pressures, becoming the latest bank to sell or scale back its operations in the once lucrative sector. Deutsche Bank will exit energy, agriculture, base metals and dry bulk trading, it said on its website, retaining only precious metals and a limited number of financial derivatives traders. The U.S. economy expanded in the third quarter at a faster pace than initially reported, led by the biggest increase in inventories since early 1998. Consumer spending slowed. Gross domestic product climbed at a 3.6 percent annualized rate, up from an initial estimate of 2.8 percent and the strongest since the first quarter of 2012, Commerce department figures showed today in Washington. The median forecast of 77 economists surveyed by Bloomberg predicted a 3.1 percent gain. The central bank left its key interest rate, the one that it charges commercial banks for its regular loans, at a record low of 0.25%. It also left the rate it pays on overnight deposits at zero for a 17th straight month, refraining from a decision to charge banks for briefly parking funds at the central bank. John Herod, who runs a Schlotzsky&apos;s Deli and Cinnabon in Abilene, said his workers never smiled at each other or customers and always performed tasks way too slowly. So he suspended business and put up a "CLOSED FOR ATTITUDE ADJUSTMENT" sign outside. After firing some of the worst employees, he is now "re-educating" the others on how to interact with clients and better prepare food. The marquee initially suggested he would reopen Dec. 4. but ABC 13 reports that&apos;s now been pushed back to Dec. 9. 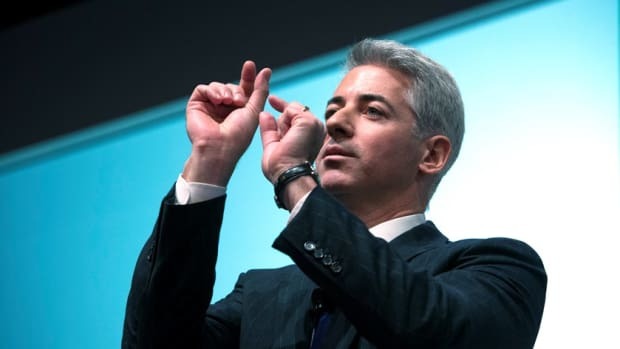 Herbalife readies finishing move on Bill Ackman; Goldman plans finishing move on Volcker rule; firefighters feast on piglets they saved from fire; and more.